• Ability to offer complex products to their customers, enhancing the customer’s product selection experience. Result: increased sales. • Minimal need for a webmaster or outside web dev shop. 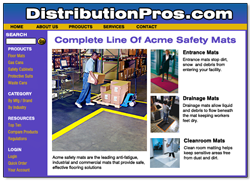 New products can be placed on distributor’s web site in minutes. Existing products, pricing, copy and more can be updated through innovative web-services-based information exchange via centralized server. • Ability for syndicated products to be stylized to adhere to the look and feel of the distributor’s web site. • Distributor does not need to purchase any software or hardware. All they need is a connection to the Internet and a web site. The product syndication services ‘bolts on’ to a distributor’s existing site – it doesn’t require any disruption of the existing E-Commerce solution. • Rather than spending hours trying to figure out how to set up a complex product for sale on their web site, distributors can ‘drag and drop’ a single line of code that will cause a ready-to-view dynamic object to display for their customers. The entire process takes only minutes. • Expand distribution capabilities by helping distributors simplify the sale of complex products online. Result: increased manufacturer sales. • Centralizes all product information at the manufacturer level, improving the exchange of product information between the manufacturer and its distributors. Product information is available as syndicated dynamic objects as well as machine-readable web-services feeds. 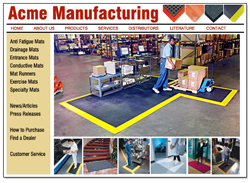 • Manufacturer can manage all content associated with each product: descriptions, SKU’s, pricing, photos, spec sheets, etc. All content uploaded to central server is immediately propagated to distributors 24/7. • Manufacturer can set pricing for each group of distributors. Distributors can configure their accounts to either automatically accept all product information updates, or to moderate them in groups, or on a product-by-product basis. • Product Syndication is a Software as a Service (SaaS). There is no software nor hardware to purchase nor install. The service is pre-installed on our servers in our data center. • This service can be a revenue stream for the manufacturer, offered as a subscription service or assigned to the distributor as an added value proposition. • Manufacturers have a vested interest in the success of their distributors. Any tools that help their distributors sell their products is of benefit to the distributor, and will tend to strengthen the relationship. • Enhanced shopping experience for customers. Result: increased sales for both the distributor and manufacturer. • Strengthens the manufacturer/distributor relationship, increasing perceived switching barriers with respect to competing manufacturers. • Simplifies the selection process of products with complex and confusing variations such as length, width, thickness, color, etc. • Allows product information to be efficiently and instantly downloaded from a centralized server, ensuring that product information at the distributor level is up-to-date. Information includes pricing, descriptions, SKU’s, photos, spec sheets, etc. of updating product information with quick and easy automated information exchange – right over the Internet.